If you can't find the answer you're looking for, please contact our Audio/Video staff at sermons@mbc.on.ca, or by calling the MBC office at 1-705-789-0123. This site allows people to download digital audio files of sermons recorded at Muskoka Bible Centre. This is accomplished by purchasing a "redemption code" from the bookstore at MBC, and using that code on this website to "unlock" your purchase and download the sermons. All of your purchases remain available through your account on this site, should you wish to download any of the sermons at a future date. When you begin using this site for the first time, you must register a new account. Your account is based on your email address and a password that you create. Your password can be whatever you want, but it must be at a minimum of 4 characters long. It is recommended that you use a longer password with a combination of letters, numbers and symbols. To sign in, you enter the email address you provided when you registered, as well as the password you created. You can also check the "Remember Me?" box if you don't want to sign in every time you visit the site. If you forget what your password is, click on the "Forgot Password" link. This takes you to a page where you enter the email address you use to sign in to the website. When you click on "Send Password Reset Email", an email containing instructions for resetting your password will be sent to the email address you provided. 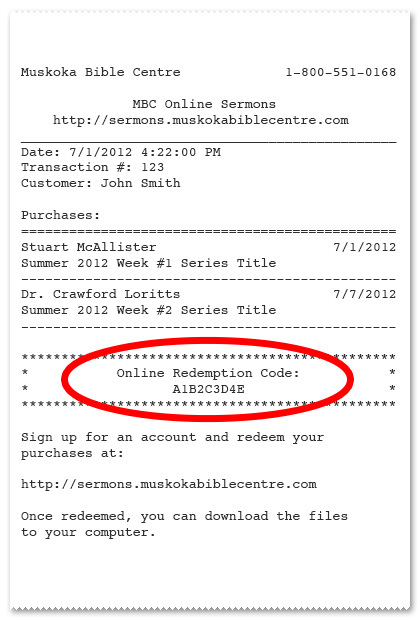 When you purchase a sermon or series from the bookstore at MBC, you will receive a receipt like the one below. The "Online Redemption Code" (circled in red above) is required in order to redeem your purchase through this website. Upon signing in to your account, you will see a box titled "Enter a Redemption Code". Input the code from your receipt, and click the "Redeem Purchase" button. If you have entered to code correctly, you will see a message indicating that your purchase has been successfully redeemed, and a list of your purchases (individual sermons or full series) will be displayed. If you did not enter the code correctly, or the code is not valid, you will see a red error message. Please try the code again to make sure you have typed it correctly. If the code still doesn't work, please contact the MBC office. From within your account, you can click on "My Sermons" on the menu. This page will display a list of all of the full series and individual sermons that you've purchased. Clicking on a series or sermon will show you details about it, and will also present you with a "Download" button for each sermon that is available. Clicking the "Download" button will save the sermon's digital audio file (in MP3 format) to your computer. Sermon's that are not yet available for download (i.e. they haven't been recorded yet) will display a "Not available yet" button instead of the "Download" button. You will be notified by email when the sermon becomes available for you to download.